Gamersyde has new screenshots of Street Fighter IV. The facial expressions are over the top! Here's a video from an older post. Warhawk Paint & Insignia Contest! Lucas Arts introduced another behind the scenes video of the upcoming Star Wars: The Force Unleashed. Find out about the story, the main characters which include, the "Secret Apprentice", Juno Eclipse, General Kato, and Darth Vader. The 3rd video, which is the newest, discusses the physics engine used, Havoc, the AI named Euphoria, and Digital Molecular Matter. Now we must wait until the end of August. Were at Winter X-Games 12, Come Play with Us! Here is PixelJunk Monsters from the Japan PSN Store. Hopefully you already have a Japan PSN account, if not follow this guide. We're guessing that it will be released in North America this week. The object of the game, similar to other Tower Defense games, protect your citizens. You set up offensive towers (Canon, Arrow, Ground to Air, and Fire Towers in the demo) in order to kill the monsters before they get to your base and kill your citizens. You collect coins, in order to build towers, and gems, in order to research new towers. Here's our old post with a Tower Defense game. As you can see PixelJunk has added minor differences that makes it feel like a new game. They also chose a great soundtrack. Here are some high resolution scans of V-Jump magazine's article on the upcoming Final Fantasy XIII. The release date is unknown but these should be enough to whet your apetite. Anyone care to translate anything that's newsworthy? TMHO Extra Twisted Edition: But Wait Theres More! Play.com has priced PlayTV for the PlayStation 3 at 99.99 and is set to be released by the end of March in the UK. Here is their description. Play TV is the way to receive, record and programme digital terrestrial television through your PlayStation 3. Simply plug your TV aerial into the Play TV TV-tuner, and connect to your PS3 via the USB cable provided. Instantly you will be able to receive more TV and radio channels than before, and will have total control of your TV viewing. You can check our older post which shows the PlayTV demonstration. Check play.com for ordering information. Unfortunately there are no plans for North America as of yet. We will have to wait until this summer but Soul Cailbur IV will include Darth Vader, exclusively for the PlayStation 3. Swords and Lightsabers will be drawn as NAMCO BANDAI Games America Inc. and LucasArts today announced that iconic Star Wars characters will appear in Soulcalibur IV for the PLAYSTATION3 computer entertainment system and Xbox 360 video game and entertainment system from Microsoft. 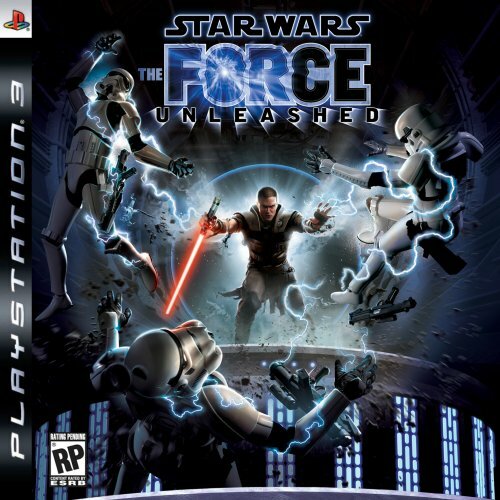 As part of this monumental collaboration, the Sith Lord Darth Vader will appear as a guest character in the PLAYSTATION3 system version of the title, and Jedi Master Yoda will be available for the Xbox 360. Delivering a robust offering of new gameplay modes and enhanced features, Soulcalibur IV will raise the bar of excellence for all next-generation fighting games when it is released in Summer 2008. Pre-order Soul Calibur IV for PS3 now. Here are some pre-alpha footage of the mmorpg from Sony, The Agency. Character design of both UNITE and PARAGON. You are not locked into your character, you can choose your type in order to fit the mission at hand. Inside the UNITE field office. First or third person view is available depending on the activity or play style. Alias - used to hide from opponents. Field Medics - revive players. Field technician - able to drop and create check points and weapons throughout the mission. Agency Moments - a special move or objective which can include all team players. Videos 2 and 3 show a sample mission which was designed to take 30 minutes to complete. The group of 3 agents have to follow an enemy agent and disrupt their mission. Each mission can be played solo as well. Here's some more info on The Agency. Here's another PSN Store game that allows you to use your own music as a custom soundtrack for the game. If you go to the Audio options of Super Stardust HD, you can access the music on the PS3's hard drive and use them as the soundtrack. So how is it that a $10 downloadable game can offer this feature, while $60 multi-gb big studio games can't? Super Stardust HD is tons of fun and is a great way to listen to your own music. 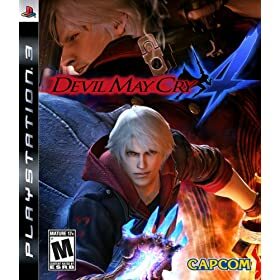 Devil May Cry 4 for the PS3. Here is his quick summary of the German GamePro article. You tilt the Sixaxis controler to move the camera. 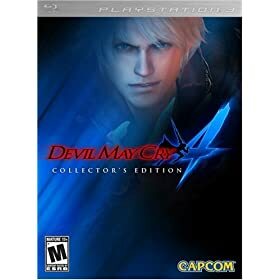 Volume 1 of "Devil May Cry: The Animated Series" on DVD with four complete episodes of the anime, a unique Steelbook metal case, a bonus DVD "Making of Devil May Cry 4," music from the soundtrack, a digital artbook, and PC content (screen savers, wallpapers, and icons). What If You Could Go To CES? 1up goes to Capcom headquarters in Japan and gets to play Street Fighter IV, which is in early development stages. Set after Street Fighter II Turbo and before Street Fighter III. The main focus at the moment is developing the 12 original characters from SFII. New revenge meter builds up when you block. Worldwide ranking or organized online tournaments? Here are 5 videos including the Hadouken and the Dragon Punch. 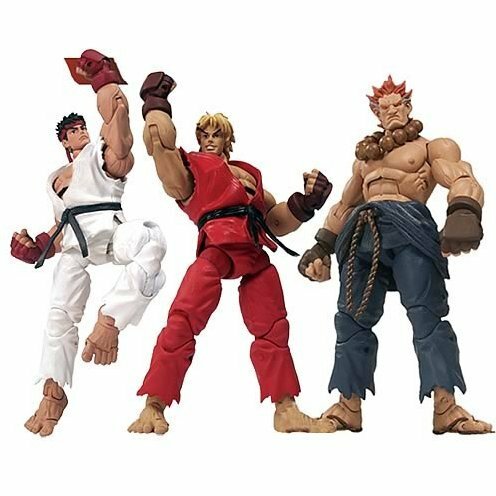 The re-issued SOTA Street Fighter action figures should hold us of until the release of SFIV.